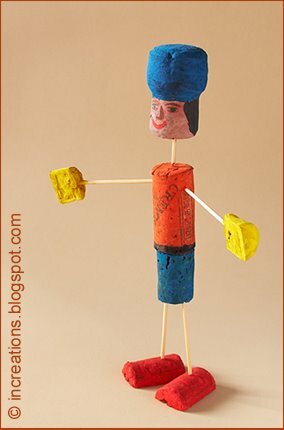 In order to make this doll you will need five corks, five wooden toothpicks and paint. Use a large cork for the body, push the toothpick into the body for the arms, legs and neck. Then cut other two corks in half and use the halves for the hands and feet. Finally, make the head from another cork and attach it. Color the finished doll. Another funny "recycled" doll can be made from clothespins. great and fun! Love your quilling projects too. The strips for the roses are half centimetre wide and between 20 and 30 cm long.